Lyme disease is caused by spirochetes of the Borrelia burgdorferi sensu lato complex. They are transmitted mainly by Ixodes ricinus ticks. After a few hours of infestation, neutrophils massively infiltrate the bite site. They can kill Borrelia via phagocytosis, oxidative burst, and hydrolytic enzymes. However, factors in tick saliva promote propagation of the bacteria in the host even in the presence of a large number of neutrophils. The neutrophil extracellular trap (NET) consists in the extrusion of the neutrophil’s own DNA, forming traps that can retain and kill bacteria. The production of reactive oxygen species is apparently associated with the onset of NETs (NETosis). In this article, we describe NET formation at the tick bite site in vivo in mice. We show that Borrelia burgdorferi sensu stricto spirochetes become trapped and killed by NETs in humans and that the bacteria do not seem to release significant nucleases to evade this process. Saliva from I. ricinus did not affect NET formation by human neutrophils or its stability. However, it greatly decreased neutrophil reactive oxygen species production, suggesting that a strong decrease of hydrogen peroxide does not affect NET formation. Finally, round bodies trapped in NETs were observed, some of them staining as live bacteria. This observation could help contribute to a better understanding of the early steps of Borrelia invasion and erythema migrans formation after tick bite. Lyme disease is an emerging illness caused by infection with Borrelia burgdorferi sensu lato (s.l.) spirochetes. The chronic illness affects the human heart, skin, joints, and musculoskeletal and nervous systems. To date, 11 species have been identified within the B. burgdorferi s.l. complex in Eurasia (1), but only 3 are considered major causative agents of Lyme disease: B. burgdorferi sensu stricto (s.s.), B. garinii, and B. afzelii. B. burgdorferi s.s. is predominant in the United States, whereas B. garinii and B. afzelii are most frequent in Europe and in Asia (2, 3). B. burgdorferi s.l. are transmitted by hard ticks that feed on the blood of multiple host species, including mammals, birds, and reptiles. Adult ticks can feed for 7–10 d on the same host without being rejected. During the blood-feeding process, bioactive molecules that are able to counteract and/or modulate the host immune defense mechanisms are produced by ticks and secreted into saliva. Nevertheless, several host species can develop resistance after repetitive infestations (4). Ticks are also the vectors of numerous other pathogens, such as tick-borne encephalitis virus, the agent of tick-borne encephalitis in humans, or Babesia bovis and Theileria parva, the agents of babesiosis and East Coast fever in cattle, respectively. Ixodes scapularis and I. ricinus are the main vectors of B. burgdorferi in North America and Europe, respectively, and the key participants in enzootic maintenance of spirochetes. When a tick feeds on a host, inflammatory cells infiltrate the injured tissues. Neutrophils are the earliest cells to accumulate at the lesion site (5). They alter tissues by releasing several granular enzymes and other antibactericidal factors, such as reactive oxygen species (ROS). The latter are generated by activation of NADPH oxidase at the cell and phagosome membranes. Neutrophils can kill pathogens after phagocytosis and ROS release into their phagolysosomes. In addition, nuclear DNA of activated neutrophils can be extruded in the extracellular milieu, forming a trap that possesses antibacterial properties (6). During the process of DNA extrusion, elastase and myeloperoxidase (MPO), which are present in neutrophil granules, are also extruded and compounded with DNA and citrullinated histones, forming structures named “neutrophil extracellular traps” (NETs). This cell death process appears distinct from apoptosis or necrosis and depends on ROS and MPO production (7, 8). In vitro, B. burgdorferi s.l. is sensitive to H2O2 produced by neutrophils and to granule enzymes like elastase or cathepsin G (9). The susceptibility of the spirochete to NETs is unknown at present. Nevertheless, B. burgdorferi s.l. developed mechanisms to escape neutrophil defenses by inhibiting their chemotaxis induced by fMLF activation and their phagocytosis and oxidative burst via OspB (10). Moreover, the swift movements of Borrelia spirochetes allow them to escape neutrophils (11). Motile helical forms or spirochetes of Borrelia burgdorferi s.l. cells can also metamorphose into round, nonmotile cyst forms called round bodies (RBs), or round body propagules, when conditions become unfavorable. These conditions include starvation, changes in milieu composition, and, of interest, antibiotic treatment. Favorable conditions lead to reversion to the swimming helical form (12). RBs represent a genuine stage in the life cycle of Borrelia and other Spirochaetales and are not just degenerative forms. The implications for diagnosis, treatment, and disease characteristics have only recently been recognized (13). Indeed, RBs have been associated with neurodegenerative diseases, resistance to antibiotic therapy, and persistence in tissues. Tick saliva facilitates the development and pathogenicity of Borrelia (14). Its immunosuppressor effects on the hosts are not yet completely elucidated. Recently, we showed a reduction of the specific Ab production upon tick infestation, which could influence bacterial transmission (15). IrLBP (I. ricinus lipocalin binding protein) binds leukotriene B4 (LTB4) and inhibits neutrophil transendothelial migration induced by LTB4 (16). This deficit in functional neutrophils at the tick bite site appears to enhance bacterial propagation and the formation of erythema migrans (17). 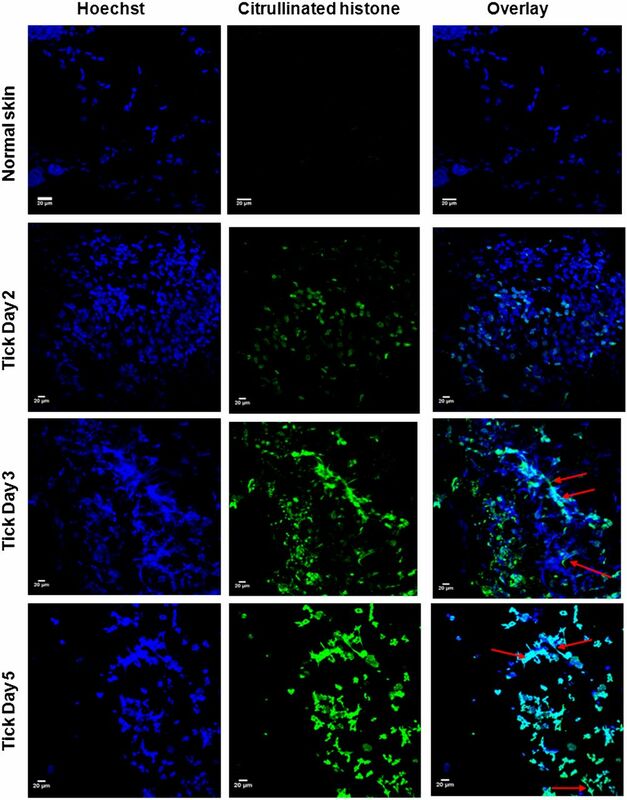 Ribeiro and colleagues (18) have shown that I. scapularis saliva inhibits in vitro neutrophil functions, including aggregation, and phagocytosis, as well as ROS production and granule exocytosis. The factors responsible for these processes were not identified. Recently, two proteins, ISL929 and 1373, were shown to downregulate neutrophil integrin expression and to reduce the production of superoxide anions (19). The member of the serpin superfamily, Iris (I. ricinus immunosuppressor), is a specific elastase inhibitor expressed in I. ricinus saliva (20). It interferes with hemostasis and the immune response of the host. However, the effect of ticks on NET formation has not yet been explored. The inhibitory effect of tick saliva on neutrophil functions, including phagocytosis, ROS production, and elastase release, can explain the inability of these cells to kill B. burgdorferi s.l. during blood feeding. Although it is conceivable that NET formation could be a barrier to their propagation, nothing is known about the interaction between NET and B. burgdorferi s.l. or about the effect of tick saliva on this mechanism. In this study, we described the presence of NETs at the tick bite site in vivo. Ex vivo, we evaluated the capacity of freshly prepared human NETs to retain and kill B. burgdorferi s.s. We also studied the effect of I. ricinus salivary gland extract (SGE) or saliva on NETosis. Because NETosis is dependent on H2O2 production, we analyzed the effect of tick saliva on H2O2 production by human neutrophils. In summary, we showed that neutrophils accumulate at the tick bite site. Neither tick saliva nor SGE appeared to influence NETosis. In vitro, NETs can trap and kill spirochetes. However, entrapped but live RBs were observed, suggesting that RBs might be an original mechanism of evasion by bacteria during NETosis. Human blood was obtained from healthy volunteers. Institutional review board approval was obtained from the Centre Hospitalier Universitaire de Liège (Liège, Belgium), and written informed consent was provided by study participants in accordance with the Declaration of Helsinki. Regarding animal experimentation, the Guide for the Care and Use of Laboratory Animals, prepared by the Institute of Laboratory Animal Resources, National Research Council, and published by the National Academy Press, was followed carefully (Commission on Life Sciences 1996). Local and national (Belgian and European legislation) animal care guidelines were followed. The protocols were approved by The Animal Care and Use Committee of the University of Liège (permit nos. ULg/06/0560 and ULg/08/0797 for mice and rabbits, respectively). All surgery was performed under isoflurane anesthesia, and all efforts were made to minimize suffering. Spirochetes of B. burgdorferi s.s. strain ZS7 were cultured in Barbour–Stoenner–Kelly medium H (BSK-H) Complete (Sigma-Aldrich) that contained 0.15% of agarose (Seakem, FMC Bioproducts) and 6% rabbit serum, antibiotics (rifampicin, phosphomycin), and fungicide (amphotericin B). The cultures were incubated at 33–34°C until cell density reached at least 2 × 106 spirochetes per milliliter. They were passaged at dilution 1:5 in a 15-ml Falcon tube or in a 5-ml cryotube (Nunc). The bacteria were also subcultured in serum-free medium after Cluss et al. (21), to investigate the possible secretion of nucleases. Briefly, BSK-H medium (without rabbit serum) was supplemented with 26 μM cholesterol, 12 μM palmitic acid, 12 μM oleic acid, and 2.5% (w/v) BSA (fraction V) to constitute synthetic serum-free BSK-H medium. Lipids were prepared in pure ethanol at 2000× the final concentration so that the synthetic medium contained no more than 0.15% (v/v) of ethanol. Media and supplements were all purchased from Sigma-Aldrich. To produce conditioned medium, spirochetes from a dense culture (∼108 spirochetes per milliliter) were centrifuged for 10 min at 12,000 rpm and washed twice with unsupplemented BSK-H. The pellets were resuspended in the synthetic medium (i.e., serum-free, lipid-supplemented medium) at dilution 1:1 and 1:5, and the cultures were incubated for 20 h or 7 d at 32°C. The supernatants from spent medium after 20 h or 7 d of incubation were cleared of bacterial cells by two successive centrifugations for 10 min at 13,000 rpm in sterile, DNase-free Eppendorf tubes. The viability of spirochetes was verified before centrifugation and on the discarded pellets by microscopy. Conditioned media were used immediately or stored at −80°C. DNase assays were performed as described by Berends et al. (22), with modifications. We assessed the degradation of human placental DNA by spirochete-conditioned serum-free lipid-supplemented BSK-H medium. Controls included 1) fresh serum-free synthetic BSK-H medium, 2) supernatants from Staphylococcus aureus grown for 4 h in brain–heart infusion medium (BHI; Becton-Dickinson) at 37°C with agitation, 3) fresh BHI medium, and 4) ultrapure water. Total DNA type XIII from human placenta (D7011; Sigma-Aldrich) was resuspended in sterile purified water (Direct Q; Millipore) at 1 mg/ml. One typical nuclease assay contained 22.5 μl DNase buffer (3 mM MgCl2; 3 mM CaCl2; 300 mM Tris, pH 7.5), 0.625 μl placental DNA, and 2.5 μl conditioned medium. The test tubes were incubated in a water bath at 37°C for 120 or 180 min. An aliquot (8 μl) of each digested sample was analyzed on 1% w/v agarose gel in the presence of ethidium bromide. As a marker on each gel, 2.5 μl SmartLadder DNA size markers (Eurogentec) was used. All experiments were performed using sterile, DNase-free, virgin plastic ware. Pictures were taken with an image capture device, using the Quantity One software (Bio-Rad). In another experimental series, tick saliva was collected as described below. A total of 1 μl (728.6 ng total proteins) was introduced into the DNase assay in place of culture supernatants. Adult I. ricinus ticks were fed by placing them under a plastic capsule glued to shaved skin of New Zealand white rabbits (23). Engorged female ticks were removed after 5 d of blood feeding. Salivary glands were dissected from the live ticks and pooled. After washing in endotoxin-free PBS, the salivary glands were homogenized and centrifuged at 15,000 g for 5 min. Aliquots were stored at −80°C until use. Saliva was collected from 5-d-engorged ticks that were previously injected with a solution of phosphate buffer with 0.02% dopamine. It was pooled and dialyzed against PBS containing protease inhibitor mixture (Roche), using a 2-kDa pore membrane to remove the injected dopamine, and stored at −80°C. In vivo experiments were performed by placing a male and a female tick under a plastic capsule glued to the dorsal skin of BALB/c mice. Skin biopsy specimens were taken at the bite site, at days 2, 3, and 5 of tick engorgement. They were embedded in Tissue-Tek (Sakura) and stored at −20°C. Cryosections (10 μm thick) were made on frozen skin biopsy specimens, then placed on poly-l-lysine–coated slides and dried in air. Sections were then fixed for 10 min with cold acetone and stored at −20°C. Human blood was obtained from healthy volunteers. Blood cells were fractionated with a solution containing sodium diatrizoate and dextran 500 (Polymorphprep; Axis-Shield) by density gradient centrifugation with a specific gravity, 500 g, 30 min at 20°C. The interface containing polymorphonuclear cells was removed. After two washes, neutrophils were incubated in culture medium (RPMI 1640; Sigma-Aldrich), at 37°C in a 5% CO2 atmosphere at a final concentration of 2 × 106 cells per milliliter. Neutrophils at the concentration of 106 cells per milliliter were seeded in a five-chamber slide. NET formation was induced by 15 ng/ml PMA (Sigma-Aldrich) for 30 min or 1 h. Unstimulated cells represented the negative control. The culture medium was removed and replaced by RPMI 1640 medium containing 10 μg/ml cytochalasin D (Sigma-Aldrich) and 2% decomplemented human serum. The slides were incubated for 15 min at 37°C. To show the importance of the NET, DNase (Roche) was also added in two conditions (activated with PMA for 30 min or 1 h) at a concentration of 50 μg/ml. Then, 10 μl B. burgdorferi s.s. suspension was deposited in the bottom of each chamber for 15 min. DNA of NET and bacteria was detected by incubating with SYTO 13 (1/3000; Invitrogen) for 30 min. Supernatant was removed, and adhering cells were fixed with 4% formalin and mounted for microscopy. In a second experimental series, we applied the live/dead visualization technique described by Cornell and collaborators (24). B. burgdorferi s.s. were incubated with Hoechst 33532 stain (1/100; Invitrogen) for 30 min, pelleted, and resuspended in RPMI 1640 medium at 5 × 105 bacteria per 10 μl. NETs were induced with PMA (15 ng/ml) for 1.5 h; then Borrelia entrapment was performed, as described above. Dead spirochetes were detected by SYTOX (Invitrogen), a probe that cannot penetrate living cells but fluoresces when linked to DNA, incubated during 30 min at a concentration of 1/3000. NET and bacteria were detected using confocal microscopy (Olympus FluoView 1000). Dead bacteria appeared green, whereas live ones appeared blue. NET formation by neutrophils and B. burgdorferi s.s. entrapment were accomplished as described above. The bacteria were incubated for 30 min before detection of dead spirochetes by SYTOX (Invitrogen), as explained previously. At 10 min before the end of incubation, 50 μg/ml DNase was added to destroy NETs and thus recover all captured bacteria. Finally, the supernatants were harvested and dead bacteria were analyzed by flow cytometry (FACS Canto II; Becton Dickinson). Neutrophils, at a concentration of 2 × 106 cells/ml, were preincubated for 30 min with 20 μg/ml SGE, saliva, or the same volume of PBS (control cells), in triplicate, in 96-well plates. NET formation was then induced by 15 ng/ml PMA for 3 h. The quantity of formed NET was measured using SYTOX (1/5000; Invitrogen) for 10 min in the dark. The fluorescence was quantified using a fluorimeter (Victor2 1420 multilabel counter; Perkin Elmer). ROS production was measured by dichlorofluorescein (DCF) oxidation assay, as described (24). Briefly, 200 μl neutrophils (2 × 106 cells per milliliter) was preincubated with 5 mM DCFH-DA (Sigma-Aldrich) for 15 min and then stimulated for 15 min at 37°C in 5% CO2 atmosphere, using PMA (1μg/ml). To compare PMA stimulation with natural stimulation, we preincubated cells for 30 min with TNF-α (200 U/ml), IL-8 (50 ng/ml), or LTB4 (10 nM) and stimulated them using fMLF (1 μM). To determine ROS production by neutrophils in which NADPH oxidase was inhibited, the cells were preincubated for 5 min with DPI (diphenyliodonium; 10 μM) before stimulation. To characterize the effect of tick saliva on ROS production in neutrophils, we preincubated neutrophils with SGE during different times or at different concentrations, at 37°C in 5% CO2 atmosphere, before the DCF test. Control cells were preincubated with the same volume of PBS. Data were acquired with a FACSCalibur flow cytometer and analyzed by CellQuest software. Neutrophils were detected using fluorescent immunostaining technique in skin section areas containing tick rostrum. Briefly, cryosections were rehydrated and the nonspecific sites were blocked 30 min with PBS containing 3% (v/v) FBS. Then, they were incubated with an anti-mouse neutrophil Ab PE conjugated (NIMP-R14 clone; Abcam) at a 1/100 dilution, for 1 h at room temperature. After three washes with PBS, nuclei were labeled with Hoechst 33258 stain (Sigma-Aldrich) and then mounted using fluorescent mounting medium (DakoCytomation). NETs were detected using indirect fluorescent immunolabeling techniques in skin section areas containing tick rostrum. Sections were permeabilized with 0.1% Triton X-100 for 20 min at room temperature before blocking 30 min with PBS containing 3% FBS. They were then incubated with an anti-citrullinated histone Ab (ab-5103; Abcam) at a 1/50 dilution, for 1 h at room temperature, and, after three washes, with a diluted 1/1000 anti-IgG Rabbit Alexa 488 conjugated Ab (Abcam), in the same conditions. Finally, after three washes in PBS, nuclei were labeled using Hoechst 33258 stain (Sigma-Aldrich), then mounted using fluorescent mounting medium (DakoCytomation) and observed by confocal microscopy (Olympus FluoView 1000). Statistical analyses between experimental conditions were performed using parametric (t test) or nonparametric (Mann–Whitney) tests and one-way ANOVA as implemented in the Sigma-Aldrich Stats 3.5 software. Mice were infested by female ticks (I. ricinus) for up to 5 d. Then cryosections were prepared from skin at the tick bite site. We observed a thickening of the skin, compared with noninfested mice (Fig. 1A, 1B). This was due to the formation of a nutritive cavity, vasodilatation, and a massive influx of inflammatory cells and interstitial fluid. Immunohistochemical analyses showed massive neutrophil infiltration at the tick bite site, all around the nutritive cavity (Fig. 1A). In the infiltrated zone, the presence of NET was revealed by fluorescence microscopy through colocalization of citrullinated histones and DNA (Fig. 2). When studying NET formation during the first part of tick infestation, we observed few NETs but several hypercitrullinated nuclei at day 2, compared with uninfested skin. At day 3, NETs localized mainly in the superior dermis and under epidermis, whereas at day 5 they were clearly detected in the deep dermis, along the nutritive cavity. Skin sections of mice 5 d after infestation by an adult female tick. Neutrophils were searched by immunodetection in mouse skin at day 5 of tick infestation, close to nutritive cavity (A) and in normal skin area (B). Cryosections were incubated in the presence of the DNA intercalating dye Hoechst 33258 and an anti-neutrophil mAb. Neutrophils appear in red, nuclei in blue. Clusters of neutrophils are circled in red. Neutrophils were clearly observed within and around the nutritive cavity in the skin sample from the infested mouse, but not in the normal skin area. Kinetics of NET formation during blood feeding. NETs were detected using a colabeling of citrullinated histone (green) and DNA (Hoechst, blue). Normal skin and infested skin at days 2, 3, and 5 were compared. Examples of NETs are indicated with red arrows. Scale bar, 20 μm. Next, we investigated the possible influence of tick saliva or SGE on NETosis. NETs formed in vitro by isolated human peripheral blood neutrophils incubated with tick SGE were quantified by SYTOX staining. We showed that the fluorescence emitted by freshly prepared human neutrophils stimulated during 3 h with PMA was higher than that of unstimulated cells (Fig. 3). Fig. 3A shows that SGE did not induce NET formation in the absence of PMA. A 30-min preincubation of neutrophils with SGE prior to PMA activation did not lead to a significant difference in NET production. Moreover, we showed that NETs formed by neutrophils preincubated with tick saliva before stimulation are quantitatively similar to those formed by neutrophils preincubated with SGE (Fig. 3B). Quantification of NETs using SYTOX. 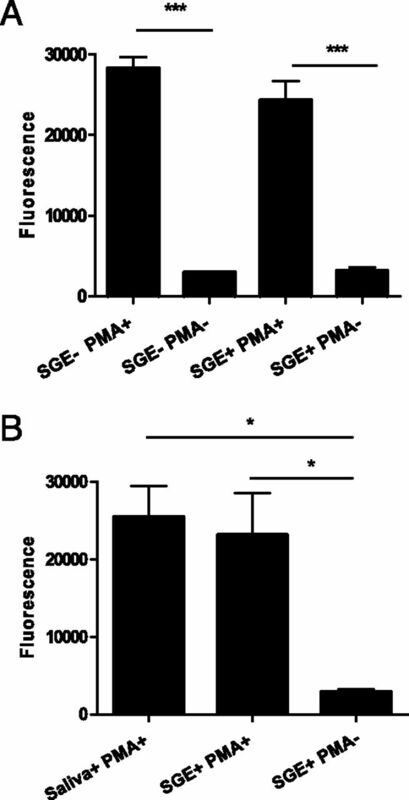 Measurement of fluorescence emitted by extracellular DNA after (A) cell incubation with SGE or an equal volume of PBS for 30 min and activation, or not, with 100 ng/ml of PMA for 3 h; or (B) cell incubation with 20 μg/ml of SGE, saliva, or an equal volume of PBS for 30 min and activation with 100 ng/ml of PMA for 3 h. *p < 0.05, ***p < 0.001. Therefore, neither tick SGE nor saliva appeared to influence NETosis. NETs seem to constitute an important defense mechanism to contain the propagation of bacteria. To evaluate the effect of these traps on B. burgdorferi s.s., we induced NETosis by human neutrophils with PMA while preventing phagocytosis using cytochalasin D. B. burgdorferi s.s. spirochetes were added, and both bacteria and NETs were detected using Syto13. As presented in Fig. 4A–C, we observed that many spirochetes were entrapped in NETs, whereas only a few were trapped when neutrophils were left unstimulated or were treated with DNase. Confocal microscopy analyses of entrapped B. burgdorferi s.s. by NETs. Neutrophils were activated with PMA for 30 or 60 min and treated with cytochalasin D to prevent phagocytosis. B. burgdorferi were then added to the cultures for 15 min before DNA labeling with SYTO 13. Trapped dead bacteria appeared as fluorescent green spots. (A) Unstimulated or DNase-treated neutrophils before addition of bacteria constitute the control condition. Activated DNase-free neutrophils retained bacteria, as seen in (B) and (C) [zoom of frames in (A)]. Trapped bacteria appear fluorescent green (red arrows). Scale bar, 20 μm. We used a live/dead staining method (24) to assess whether entrapped bacteria were killed by NETs. First, we induced NET formation with PMA before adding Hoechst stain–labeled B. burgdorferi s.s. to the neutrophil culture. Then, SYTOX, a DNA-labeling dye that does not penetrate living bacteria, was used to detect dead bacteria. As shown in Fig. 5a, we observed that a large number of bacteria were positive for SYTOX under these conditions. We also observed B. burgdorferi s.s. appearing in the form of RBs; these bacteria reacted with Hoechst stain but were SYTOX negative (Fig. 5B). RB formation was not induced by RPMI 1640 medium because they were not observed when Borrelia was incubated in RPMI 1640 or in RPMI 1640 supplemented with 2% v/v heat-inactivated serum for the same time (data not shown). Moreover, when NETs were pretreated with DNase, few bacteria were retained and most of them were alive (Fig. 5A). Confocal microscopy analyses of B. burgdorferi s.s. killing by NETs. Live/dead labeling of B. burgdorferi incubated with activated neutrophils. These cells were activated for 90 min, then treated with cytochalasin D to prevent phagocytosis before coculture with Hoechst-labeled live Borrelia (stained in blue). After 30 min, cells were incubated with SYTOX (green), a probe penetrating only dead cells and labeling DNA (A, B). Neutrophils treated with DNase after activation represent the control condition (A). Red arrows indicate fluorescent blue structures that have the morphology of RBs. Green arrows indicate typical spiral-shaped spirochetes. (B) represents zoom of frames in (A). Scale bars, 20 μm (A), 5 μm (B). To assess the efficiency of NETs at killing B. burgdorferi s.s., we collected NETs containing bacteria and quantified dead spirochetes. We verified that the RPMI 1640 medium containing DNase, cytochalasin D, or decomplemented human serum did not affect bacterial survival (a mean of 0.5% of dead B. burgdorferi s.s.). Unactivated neutrophils treated with cytochalasin D killed very few bacteria during the coculture (1.8% of dead B. burgdorferi s.s.), whereas PMA-treated neutrophils were able to significantly kill bacteria (30%, p = 0.004; Fig. 6). This percentage significantly decreased when the culture medium contained DNase (17%, p = 0.013; Fig. 6). Quantification of dead B. burgdorferi s.s. Live/dead Borrelia organisms were quantified by flow cytometry. Neutrophils were activated for 90 min, then incubated with cytochalasin D to prevent phagocytosis. Hoechst-labeled Borrelia were cocultured with neutrophils for 30 min before the addition of SYTOX. Supernatants containing NETs and bacteria were removed, and SYTOX-positive cells were anayzed by flow cytometry. Several control conditions were also established: Borrelia without neutrophils in RPMI 1640 medium containing 2% v/v heat-inactivated human serum (medium), Borrelia with unactivated neutrophils (unstimulated), Borrelia with unactivated neutrophils treated with DNase (unstimulated + DNase), and Borrelia with activated neutrophils treated with DNase (PMA 1 h, 30 min + DNase). *ρ = 0.05, **ρ = 0.01. Next, the ability of B. burgdorferi s.s. to secrete DNase, which would help spirochetes to evade NET entrapment, was tested. Human placental DNA was incubated in the presence of (1) fresh BHI medium; (2) supernatant from cultures of Staphylococcus aureus; (3) fresh serum-free, lipid-supplemented BSK-H medium; or (4) supernatant from dense cultures of B. burgdorferi s.s. spirochetes grown in serum-free lipid-supplemented BSK-H medium. Smearing of the material after gel electrophoresis was taken as evidence of DNA degradation and hence the presence of secreted DNase. 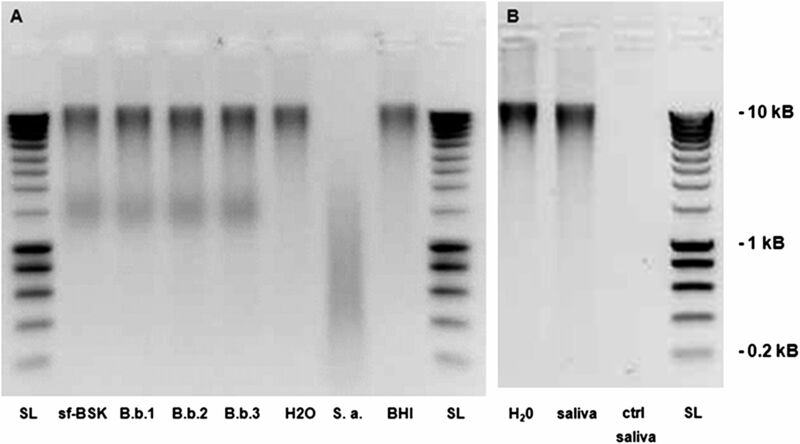 As expected, the supernatant from S. aureus caused a clear degradation of human placental DNA, whereas no degradation was seen in tubes incubated with fresh BHI or water (Fig. 7A, lanes 1 and 2). Similarly, the supernatant from spirochetes cultivated in serum-free BSK-H for 20 h or 7 d showed no evidence of nuclease activity. Absence of DNase activity in B. burgdorferi s.s. culture and tick saliva. (A) Detection of nuclease activity in conditioned medium. Total DNA from human placenta was incubated in the presence of fresh serum-free BSK-H medium (sf-BSK, lane 2), spun supernatant from spirochete culture grown for 20 h after being inoculated at 1:1 (B.b.1, lane 3), grown for 20 h after being inoculated at 1:5 dilution (B.b.2, lane 4), grown for 7 d after being inoculated at 1:5 dilution (B.b.3, lane 5). Controls included DNA incubated with ultrapure water (H2O, lane 6), spun supernatant from S. aureus culture in BHI medium (S. a., lane 7), and fresh BHI medium (BHI, lane 8). DNA samples were then analyzed by electrophoresis on 1% agarose gels next to 2.5 μl of Smart Ladder size markers (SL, lanes 1 and 9). The large higher band corresponds to undegraded DNA. The smaller band in lanes sf-BSK, B.b.1, B.b.2, and B.b.3 corresponds to the BSA component of the culture medium that binds ethidium bromide nonspecifically. The expected degradation by S. aureus was observed, but no significant degradation of DNA was observed with supernatant from Borrelia cultures. (B) Detection of DNase activity in tick saliva. DNA was incubated in the presence of ultrapure water (H2O, lane 1) and tick saliva (saliva, lane 2). One lane was loaded with tick saliva alone (ctrl saliva, lane 3). No significant degradation was observed with tick saliva. Samples were run next to Smart Ladder DNA size markers (SL, lane 4). In parallel, we tested the ability of tick saliva to degrade human DNA. Human placental DNA incubated in the presence of I. ricinus saliva showed no degradation, compared with controls (Fig. 7B). In summary, we found no evidence of nuclease activity (DNA degradation) by B. burgdorferi s.s. spirochetes or I. ricinus saliva, suggesting that the bacteria cannot evade NETs, even when inoculated with tick saliva. Because NET formation has been linked to ROS production, we investigated the effect of I. ricinus tick SGE on ROS production by human neutrophils. We used a DCF oxidation assay to measure hydrogen peroxide production resulting from oxidative burst in living cells. Human neutrophils were preincubated with SGE before the addition of various substances inducing the oxidative burst, such as TNF-α, LTB4, or IL-8, and before fMLF activation. We also compared this production with that induced by PMA. Hence, we showed that cells treated with SGE (20 μg proteins per milliliter) during the 2 h before activation produced significantly less ROS than did control neutrophils, independently of the priming molecules or activator used (Fig. 8). Tick SGE did not induce ROS production by itself (Fig. 8). ROS production by human neutrophils upon various stimuli. The mean fluorescence (GMean) emitted after neutrophil labeling with DCF was measured. (A–D) Neutrophils were incubated in a medium with or without tick SGEs (20 μg/ml of proteins) for 2 h; (E) cells were incubated for 2 h in a medium containing 20 μg/ml of tick SGE proteins, tick saliva proteins, or an equal volume of PBS. Priming was performed for 30 min, using (B) IL-8 (50 ng/ml), (C) LTB4 (10 nM), and (D) or (E) TNF-α (200 U/ml). After priming, cells were stimulated with 1 μM fMLF (B–E). In (A), cells were not primed but activated during 15 min with PMA (1 μg/ml). *p < 0.05, **p < 0.01, ***p < 0.001. Because SGE contains cellular and other compounds absent in saliva, we also tested the effect of collected saliva. Saliva was dialyzed to exclude the action of low m.w. components such as dopamine (which was used to induce salivation). We were aware that the dialysis process also removed small molecules like PGE2. We showed that saliva, as well as SGE, significantly inhibited ROS production by neutrophils (p < 0.001). Hence, collected saliva and SGE possessed the same inhibitory effect on ROS production by human neutrophils (Fig. 8E). B. burgdorferi s.l. is transmitted by I. ricinus ticks and causes Lyme disease. Neutrophils constitute the first barrier against infiltrating pathogens, owing to phagocytosis, oxidative burst, their lytic enzymes, and NETosis. Lusitani et al. (9) demonstrated that, in vitro, this bacterium is sensitive to H2O2 resulting from oxidative burst, to elastase, and to cathepsin G contained in neutrophil granules. Xu and collaborators (17) showed that a deficit of functional neutrophils at the tick bite site increases bacterial propagation and the formation of erythema migrans. So far, the effect of NETs on B. burgdorferi s.l. has not been investigated. Nevertheless, NETosis might play a significant role in the containment of this spirochete. In this study, we investigated whether Borrelia cells could be retained and killed by NETs in vitro. It has been known for a long time that tick saliva facilitates Borrelia propagation into host tissues; however, the mechanisms are still not completely understood (14). 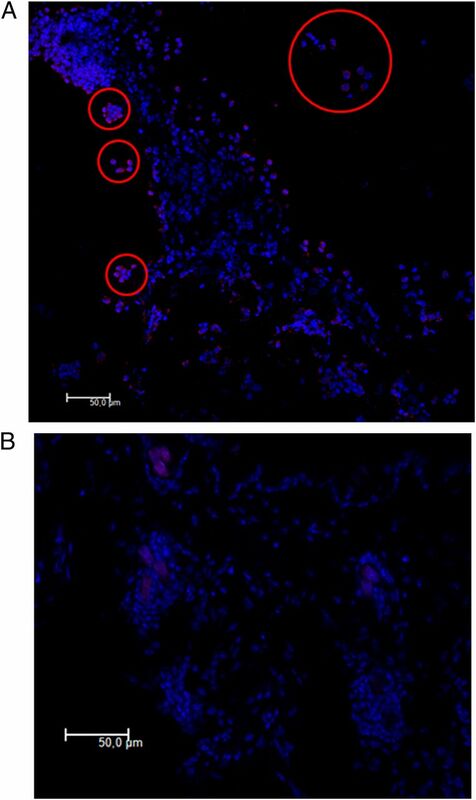 A decreased phagocytic capacity of human neutrophils and of mouse macrophages in the presence of I. ricinus or I. scapularis saliva was described (18, 25). Because neutrophil infiltration is massive at the tick bite site, we hypothesized that tick saliva could facilitate bacterial propagation by decreasing NET formation. First, we observed the presence of extracellular traps in vivo, at the bite site, close to the nutritive cavity, in infested mice. NETosis was clearly apparent from the day 3 of the infestation on. In vitro, we quantified the extracellular DNA produced by activated human neutrophils in a medium containing tick SGE or saliva. In vitro, only a few apoptotic cells were observed (data not shown), indicating that the quantified DNA did not come from apoptotic material. Tick saliva did not affect the quantity of NETs. The amount of extracellular DNA produced in vitro was similar to that formed in a medium without tick saliva or SGE. Together, the results from in vivo and in vitro experiments indicated that tick saliva did not induce or did not prevent or decrease the formation of NETs. In contrast, tick saliva could contain nucleases able to degrade NET and facilitate propagation of the bacteria. However, we did not observe any DNA degradation by tick saliva. NET formation is dependent on hydrogen peroxide production and more precisely on the singlet oxygen (7, 26). Some time ago, Ribeiro (18) showed that I. scapularis inhibits the production of ROS by zymosan-stimulated neutrophils. This observation might be explained by the observed decrease in phagocytosis rather than by a direct effect of salivary molecules on ROS production. Guo and collaborators (19) isolated two proteins from I. scapularis saliva (ISL929 and ISL1373) that are able to decrease O2− production by neutrophils through an as-yet unknown mechanism. In addition, immunomodulatory mechanisms are not necessarily conserved in different tick species even within the same family (27). For this reason, we evaluated the effect of I. ricinus SGE and saliva on neutrophil ROS production. Along with Ribeiro, we observed decreased ROS production by neutrophils in contact with tick SGEs or tick saliva, despite preserved NET formation. This phenomenon was dose and time dependent (data not shown). In experiments designed to evaluate NET formation, SGE was added 30 min before activation with various agents (PMA, IL-8, TNF-α, or LTB4), which led to strong inhibition of ROS production. Of interest, we found that tick saliva decreased ROS production by neutrophils, whereas it did not affect NET formation. Thus, it appears that lowering hydrogen peroxide and singlet oxygen does not necessarily lead to decreased NET formation. NETs appeared able to retain B. burgdorferi s.s. without being affected by tick saliva. We showed that NET entrapped Borrelia spirochetes. We also tested whether NET could kill entrapped Borrelia. As expected, confocal microscopy revealed that a high number of entrapped bacteria were dead, which was confirmed qualitatively by flow cytometry. However, in addition to typical motile helices, we observed that RBs of B. burgdorferi s.s. formed in contact with NETs. Several of these “round structures” were SYTOX negative and thus can be considered live bacterial cells. During the tick blood feeding, neutrophils are the first cells to infiltrate injured tissue at the tick bite site. Borrelia transmission from tick salivary glands to host tissues occurs 24 h after the onset of the blood meal. At that time, neutrophils are massively present. Bacteria can then persist days to weeks in the skin. This fact raised the question of knowing why NETs are unable to stop the transmission of spirochetes. Secreted DNases have been recently recognized as virulence factors in a number of important bacterial pathogens. Secreted DNase allows Streptococcus pneumoniae, group A Streptococcus, and Staphylococcus aureus to escape from NETs (22, 28–30). P. aeruginosa uses DNA as a nutrient source, thanks to a secreted DNase (31). Recently, Uchiyama and collaborators (32) showed that the prophage-encoded DNase Sda1 allows virulent strains of Gram-positive group A Streptococcus to avoid intracellular killing by macrophages. Indeed, the DNase degrades bacterial DNA that is normally recognized by TLR9, and thus prevents TLR9-dependent cytokine release in monocytes. Using a similar mechanism, we investigated whether Borrelia could evade NETs. S. aureus culture supernatant was used as positive control of DNA degradation and serum-free BSK-H as a negative control. In our hands, no secreted DNase activity was observed after cultivation of spirochetes in Cluss’s formulation of serum-free lipid-supplemented BSK-H medium for 20 h or 7 d. This medium supports the growth of spirochetes [data not shown (21)]. We had to use serum-free medium because the commonly used complete BSK-H medium contains 6% rabbit serum and the serum component has a clear DNase activity [data not shown (33)], which would mask the eventual bacterial nuclease activity. Moreover, in silico interrogations of Borrelia genomic data failed to provide evidence of secreted DNase sequence. We conclude that Borrelia spirochetes cannot escape from NETs by DNA degradation. By confocal microscopy, we observed RBs. The formation of RBs has been described in at least six genera of the Spirochaetales order (12). RB formation requires protein synthesis, and it is accompanied by the induction of a set of at least 20 proteins (34). Dunham-Ems et al. (35) proposed that RB formation in Borrelia is a default survival mode triggered when spirochetes are unable to produce sufficient energy for dissemination within the nymph. This program can be suppressed directly or indirectly by the products of genes controlled by the Borrelia homolog of the RpoS σ factor. Therefore, RBs represent a genuine stage in the life cycle of Borrelia and other Spirochaetales and are not just degenerative forms. As noted earlier in the article, the implications for diagnosis, treatment, and disease characteristics have only recently been recognized (13). Indeed, they have been associated with neurodegenerative diseases, resistance to antibiotic therapy, and persistence in tissues. When bacteria become entrapped by NETs, they are killed by high concentrations of bactericidal enzymes, such as elastase or MPO. Although antielastase activity contained in tick saliva might also protect entrapped Borrelia bacteria, it is conceivable that RBs, as such, could resist, or merely resist longer than spirochetes, in NETs. Physiologically, nuclease from the interstitial medium degrades NETs (33) and would thus eventually liberate entrapped RBs. These bodies would then propagate (maybe after switching back to the helical morphology). Therefore the formation of RBs might also represent a novel mechanism to evade NETs. In summary, we showed that NETs can imprison and kill B. burgdorferi s.s., the principal agent of Lyme disease worldwide. These spirochetes did not appear to be able to degrade the NETs. I. ricinus tick saliva did not alter NETosis, nor could it destroy NETs, although it decreased the production of ROS by neutrophils. However, we detected entrapped RBs, which stained like living bacterial cells. We hypothesized that this mechanism, probably assisted by the effects of immunomodulatory molecules present in tick saliva, could help a proportion of invading bacteria to resist NET killing. RBs might therefore represent a new mechanism of evasion from the innate immune response. A better comprehension of this phenomenon might help improve our understanding of the development of this disease. We thank D. Zorzi (from Laboratory of Human Histology), Fabrice Olivier and Luc Duwez (from GIGA–Specific Pathogen-Free Mouse Facility and Transgenics), and Gustavo Moraes, Rafaat Stephan, and Sandra Ormenese (from GIGA Cell Imaging and Flow Cytometry Facility) for excellent technical assistance. This work was supported by the Ministère de la Région Wallonne, Belgium, Contract 315543. F.B. is Senior Research Assistant of the Fonds National de la Recherche Scientifique. C.O. is a Research Associate at the Fonds National de la Recherche Scientifique. C.F. is a fellow from the Fonds pour la Formation à la Recherche dans l'Industrie et dans l’Agriculture. The funders had no role in study design, data collection and analysis, decision to publish, or preparation of the manuscript. 2011. Updates on Borrelia burgdorferi sensu lato complex with respect to public health. Ticks Tick Borne Dis. 2: 123–128.
. 2010. Lyme disease. Clin. Lab. Med. 30: 311–328.
. 2011. Lyme borreliosis vaccination: the facts, the challenge, the future. Trends Parasitol. 27: 40–47. 1996. Host immunity to ticks. Annu. Rev. Entomol. 41: 1–22. 1994. [The ultrastructural characteristics of the histopathological changes at the site of attachment to the host body of larvae of the ixodid tick Ixodes ricinus]. Parazitologia 28: 356–363.
. 2002. Borrelia burgdorferi are susceptible to killing by a variety of human polymorphonuclear leukocyte components. J. Infect. Dis. 185: 797–804.
. 2008. Borrelia burgdorferi inhibits human neutrophil functions. Microbes Infect. 10: 60–68.
. 2008. Clocking the Lyme spirochete. PLoS. One 3: e1633.
. 2009. Destruction of spirochete Borrelia burgdorferi round-body propagules (RBs) by the antibiotic tigecycline. Proc. Natl. Acad. Sci. USA 106: 18656–18661.
. 2011. Lyme disease: the next decade. Infect. Drug Resist. 4: 1–9.
. 2009. Tick saliva affects both proliferation and distribution of Borrelia burgdorferi spirochetes in mouse organs and increases transmission of spirochetes to ticks. Int. J. Med. Microbiol. 299: 373–380.
. 2008. Influence of the Ixodes ricinus tick blood-feeding on the antigen-specific antibody response in vivo. Vaccine 26: 6956–6964.
. 2008. Ir-LBP, an Ixodes ricinus tick salivary LTB4-binding lipocalin, interferes with host neutrophil function. PLoS. One 3: e3987.
. 2007. Increasing the recruitment of neutrophils to the site of infection dramatically attenuates Borrelia burgdorferi infectivity. J. Immunol. 178: 5109–5115.
. 1990. Saliva of the tick Ixodes dammini inhibits neutrophil function. Exp. Parasitol. 70: 382–388.
. 2009. Inhibition of neutrophil function by two tick salivary proteins. Infect. Immun. 77: 2320–2329.
. 2002. Characterization of a novel salivary immunosuppressive protein from Ixodes ricinus ticks. J. Biol. Chem. 277: 10083–10089.
. 2004. Extracellular secretion of the Borrelia burgdorferi Oms28 porin and Bgp, a glycosaminoglycan binding protein. Infect. Immun. 72: 6279–6286.
. 2010. 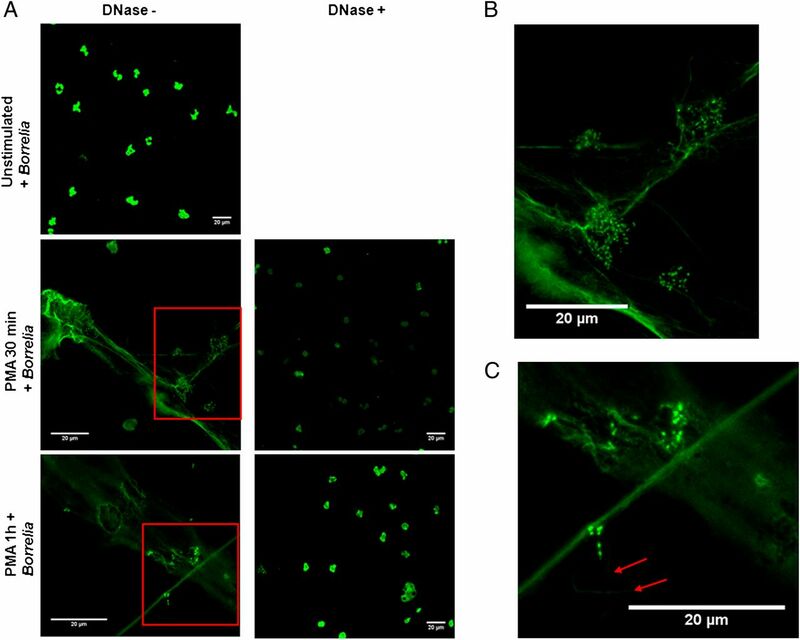 Nuclease expression by Staphylococcus aureus facilitates escape from neutrophil extracellular traps. J. Innate Immun. 2: 576–586.
. 2002. Immunosuppressive effects of Ixodes ricinus tick saliva or salivary gland extracts on innate and acquired immune response of BALB/c mice. Parasitol. Res. 88: 192–197.
. 2009. Assessment of methylthioadenosine/S-adenosylhomocysteine nucleosidases of Borrelia burgdorferi as targets for novel antimicrobials using a novel high-throughput method. J. Antimicrob. Chemother. 63: 1163–1172.
. 2001. Tick salivary gland extract inhibits killing of Borrelia afzelii spirochetes by mouse macrophages. Infect. Immun. 69: 575–578.
. 2011. Singlet oxygen is essential for neutrophil extracellular trap formation. Biochem. Biophys. Res. Commun. 413: 75–79. 1989. Immune suppression induced by the brown ear tick Rhipicephalus appendiculatus Neumann, 1901. J. Parasitol. 75: 946–952.
. 2006. An endonuclease allows Streptococcus pneumoniae to escape from neutrophil extracellular traps. Curr. Biol. 16: 401–407.
. 2006. 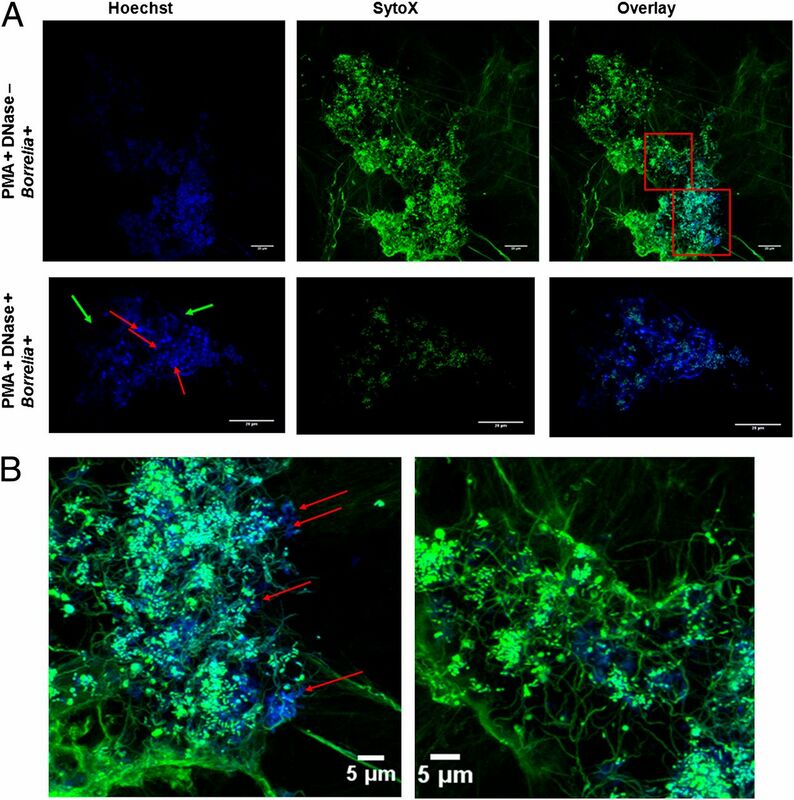 DNase expression allows the pathogen group A Streptococcus to escape killing in neutrophil extracellular traps. Curr. Biol. 16: 396–400.
. 2005. Extracellular deoxyribonuclease made by group A Streptococcus assists pathogenesis by enhancing evasion of the innate immune response. Proc. Natl. Acad. Sci. USA 102: 1679–1684.
. 2010. Pseudomonas aeruginosa produces an extracellular deoxyribonuclease that is required for utilization of DNA as a nutrient source. Environ. Microbiol. 12: 1621–1629.
. 2012. DNase Sda1 allows invasive M1T1 Group A Streptococcus to prevent TLR9-dependent recognition. PLoS. Pathog. 8: e1002736.
. 2009. Fetal calf serum contains heat-stable nucleases that degrade neutrophil extracellular traps. Blood 114: 5245–5246.
. 2000. Serum-starvation-induced changes in protein synthesis and morphology of Borrelia burgdorferi. Microbiology 146: 119–127.
. 2012. Borrelia burgdorferi requires the alternative sigma factor RpoS for dissemination within the vector during tick-to-mammal transmission. PLoS. Pathog. 8: e1002532.